Liz Thomas is almost constantly on the move—and we mean fast. After all you don’t break the woman’s unsupported speed record for the Appalachian Trail by getting bogged down in indecision. 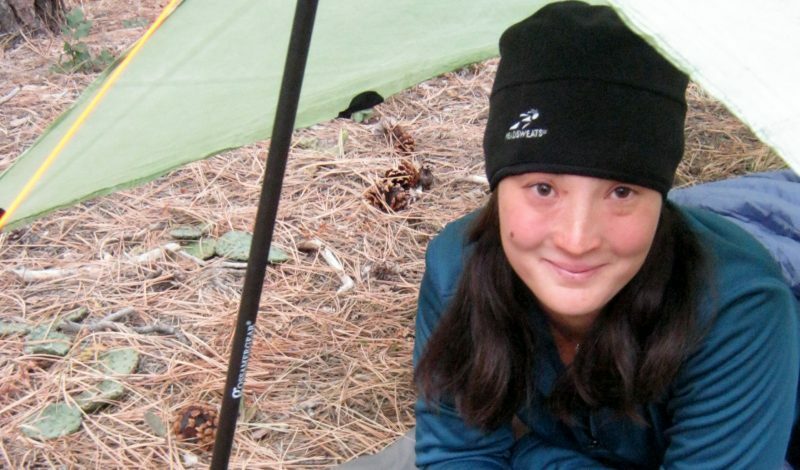 She’s completed the triple crown of hiking—the AT, the PCT, and Continental Divide Trail—considers short hikes as under 100 miles, and has logged more than 10,000 backcountry miles. She’s also the pioneer of thru hiking in urban environs, taking her light-and fast approach to the pavement as well as the trails. We caught up with her shortly after Outdoor Retailer to pick her brain on how she keeps motivated, how her backcountry kit can only weigh a measly seven pounds, and how much ice cream is too much. Gear Institute: I know you’re busy—when we last talked I think you were plotting out some new routes with Altra Footwear’s co-founder. What are you up to now? Liz Thomas: Yes, Jeremy from Altra has been helping me put together a route in Utah that should go this July. We’re still trying to keep it under wraps, but I’m very excited about it. Winter/early spring is a time for shorter hikes (100 miles or less) and a lot of yoga and running for me, but I’m busy planning a few routes and teaching some courses on backpacking. The biggest thing on my schedule for the winter, is two backpacking clinics—traditionally called “Rucks” (the German word for backpack)—one in Portland on February 28th and one here in Denver on March 14th. In addition to hiking, I serve as VP of the American Long Distance Hiking Association-West (we’re the group that gives the Triple Crown of Hiking awards to those who have hiked the AT, PCT, and CDT). These Rucks are hands-on clinics that train backpackers and hikers just getting into long-distance hiking with the skills and know-how they need to go out and make a big trip happen. Gear Institute: Talk to us about gear. I know your backpacking kit weighs an insanely light seven pounds (minus food). Walk us through what you pack, and what you wear on the trail for long-distance excursions like the AT. Thomas: My general rule of thumb to keep a pack light is to never have any of my Big Three items (my backpack, sleeping bag, and shelter) weigh more than two pounds each. I use a Gossamer Gear Kumo backpack—that’s less than one pound. My Gossamer Gear Nightlite (4 oz) sleeping pad becomes the frame of my pack, and I use it as a sit pad when I take a break. Depending on temperatures and conditions, I’ll use a quilt or sleeping bag, but usually for three-season expeditions, even as a cold sleeper, I can get away with a sub-two-pound bag, and if it is warm, even a little more than one-pound bag. For down quilts, I use the Brooks Range 15 Cloak, and for bags, I go with a Montbell Downhugger, which accommodates all the tossing, turning, and sleeping in a ball I’m bound to do in the night. When it gets super cold, I’ll sleep wearing my Montbell Ex-Light jacket (4.5 oz) on for extra warmth and just roll out of bed, ready to start hiking. For my shelter, I use a the Mountain Laurel Designs Solomid in cuben fiber, which is a new fabric originally invented for sailing that is super strong and light. I’ve been super impressed by the full coverage it provides without any weight penalty—it comes in at a whopping 10.5 oz—and is super easy to set-up even when my fingers are almost numb. It’s held up in wind, snow, rain, sleet, hail, and sun and has proved very durable over three seasons of not-so-light treatment. The rest of my pack includes “multiple use” gear—stuff that serves me in a couple ways. My NWAlpine Eyebright raingear is made out of a very breathable fabric, so if it’s not too cold out, where I used to carry a windshirt, I just carry my Eyebright and it works for warmth and rain. I always pack extra pairs of Darn Tough run/bike socks since I can’t stand putting on wet socks in the AM—but then I use them as potholders along with a pair of gloves when I’m cooking, or throw them in a stuff sack as a pillow along with my trail shoes. The Darn Toughs last forever, and are knit super tight to fit my foot better and keep grime out—both factors that reduce the blisters and chaffing. I carry a pretty minimal cookset called the Gram Cracker by Trail Designs that has everything but matches and my spork for 2.5 oz. I treat my water with a Sawyer Mini filter (2oz), which I can use with my hosed hydration system during the day or as a gravity feed in camp. My normal attire on trail is a four-pocketed hiking skirt by Purple Rain Skirts, a t-shirt, my Darn Toughs, and my Altra Lone Peak trail running shoes. 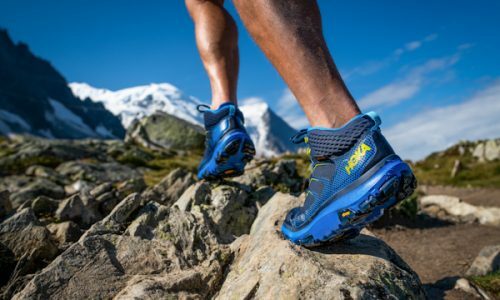 Since scientists say that every pound on the foot is like five to seven pounds on the back, the Lone Peaks are a great balance of being a lightweight shoe that can put up with the roughness of on- and off-trail travel. Long distance hiking can actually be harder on shoes than running—even if you’re covering the same mileage—since dirt gets ground into the shoes and they don’t get any washing or breathing time. I’ve been impressed how the zero-drop Altras have held up, and prevented a lot of foot, shin, and back injuries that I used to get backpacking with “normal” trail runners. It’s also amazing how having a footbox that is actually shaped like my feet prevents blisters, ingrown nails, and stress fractures when my feet start swelling after being on them for 15 hours a day for four months. Gear Institute: Naturally you use a lot of the products from the companies that sponsor you. But talk to us about some of the non-sponsored gear items like toiletries. Thomas: I think with long-distance hiking and ultralight hiking, it pays to carry a few high-quality items, and then for the rest, anything goes. A lot of light stuff in my pack can be found for free or at a drug store or even thrift store. I usually use a hydration pack and hose system, but also supplement my overall water capacity with water bottles that can be salvaged from the trash. The pot I use with my stove is an old Foster’s beer can, and you can make your own stove for free out of old soda cans or cat food cans, essentially trash. If I’m using an alcohol stove, I carry my alcohol in an old plastic water bottle instead of heavier fuel bottle. As for other gear, I found a great merino shirt at a thrift store, I always use $10 fashion tights to keep my legs warm, and am never really picky about what t-shirt I wear, as long as it’s made of a wicking fabric. As far as drug store specials, my minimal med/hygiene kit includes: sunscreen, lip balm, toothbrush (with the end broken off), tooth powder, micro bottle of hand sanitizer, one single-use antibiotic ointment, one single-use Wet One, a paper matchbook I got from a restaurant, a few off-brand Imodiums, ibuprofens, naproxins, a safety pin, a hairband, and some Leukotape sports tape. If I’m going to be out for a while, I’ll sponge off with a 50 cent bandana. Gear Institute: And now…food. I know you say you dehydrate your own meals. What’s your favorite? Thomas: My favorite meals are usually a blend of stuff I’ve dehydrated myself and stuff that I buy dehydrated or freeze-dried. I like to dehydrate my own kale, squash, and greens since those tend to be expensive to purchase pre-dehydrated. I’ll mix that with some purchased dehydrated brown rice, some crushed nuts, raisins, shredded coconut, curry, cumin, coriander, cardamom, and some lentils I’ve dehydrated at home. Then, I’ll add some Alpine Aire tomato sauce powder and freeze-dried vegetable mix to everything with lots of salt and that makes a super wholesome dinner. Some of the places I hike, even when I’m resupplying in town, it can be hard to find a good bowl of curry, so there’s nothing like making it myself when on trail. Gear Institute: And how much ice cream do you consume when you’re done with one of your epic hikes? Feel free to measure the volume by pint. Thomas: Wow. That’s an amazingly spot-on question. I would say for up to a month following a particularly long hike, it would not be out of the question to consume a pint a day, with some embarrassingly typical days resulting in two pints down. After a hike in 2013, I realized that I had gotten a double scoop of ice cream every day for two weeks going from Sweet Action to High Point Creamery to Bonnie Brae to Lik’s to Sweet Cow to Little Man—all my favorite Denver-area ice cream shops. One of the first things I do when I’ve finished a trail is go to the gas station and start hitting the Ben & Jerry’s pretty hard. 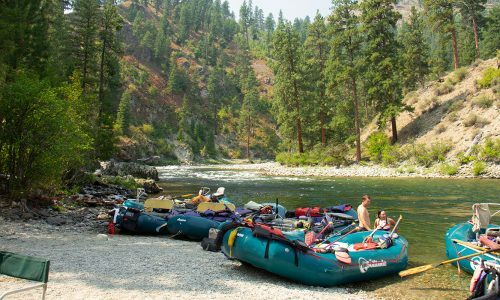 Gear Institute: Any packing tips for us mere mortal hikers? Thomas: I create a spreadsheet of all the gear I’ll need for a trip before I even start packing. Next to each item, I put how much it weighs (using a food scale), and afterwards, I spend a good hard minute trying to decide whether I will really need that item for my trip, or whether I can survive without it. After that list has everything I need, I’ll total it up, look at how much it weighs, and then figure out what can go. Repeat a few times, and then you have a nice packing list. I check off everything as I put it in my pack so I don’t forget anything (this is more common than you’d think!). Gear Institute: I love the urban thru-hike initiative that you’ve started. What city is next? Thomas: Seattle. As far as U.S. cities go, it’s ranked #3 for most public stairways. They’ve got a vibrant stair walking community who has been really supportive of the idea of outsiders visiting to walk their stairs. Also, I have friends there who can host me—which always turns a hike into something more than just a walk, but also a great way to reconnect with people I haven’t seen for a long time. Gear Institute: Anything else you’ve seen in the outdoor industry (gear-related or not) that impresses you? Thomas: I’ve been really impressed by how receptive the Outdoor Industry and Outdoor Retailer show in general this year has been to long-distance and thru-hikers. I’ve been going to the show for a while, and this is the first year that when I talk to brands and say what I do, they really get it. Before, companies didn’t really know what box to put thru-hikers in. We didn’t really fit into this image of what an outdoor athlete should be. The movie and book Wild and Robert Redford’s movie of Bill Bryson’s A Walk in the Woods have really helped mainstream thru-hiking and elevate it more towards the direction of some of the bigger outdoor activities showcased at OR, liking skiing or climbing. As an athlete, it’s been amazing to watch this transformation happening and watching long distance hiking move from the fringe into this thing that people at the show love to hear about.